This Friday, at long last, Mr. Peabody and Sherman hits theaters, and everyone who grew up loving the time-traveling dog and his boy can rejoice. But what you probably don't know is how hard it was to get this movie off the ground, and how many versions it went through. We talked to director Rob Minkoff (The Lion King), and he told us how Despicable Me forced a total rewrite of Peabody. You might have expected the basic concept to be a hard sell, since it's a talking dog who lives alone with a small boy, and they travel through time. But Minkoff says he never had to try hard to win people over, "maybe because we all know Peabody and Sherman, and [we all] know they have a WABAC machine, and know they time-travel, and those things are part and parcel of who they are as characters." They hired a physicist to advise on the time travel. They hired Ken Wharton early in the development of the film, "to make sure we were trying to tell a time travel story that made sense," Minkoff laughs. "It's tough." Wharton taught them that there were two possible theories of time travel: the block universe, or the multiverse. But since Peabody and Sherman are constantly changing history, they settled on the multiverse theory, in which every intervention creates a new universe. Early on, the team had "crazy, bizarre ideas for what might happen, like [Peabody and Sherman] break history entirely and they end up in a kind of hodge-podge of different time periodss and characters all existing in some kind of crazy, upside-down, put-backwards sort of world." This was "interesting and fun on paper, but somehow didn't quite make sense when we tried to put it together," says Minkoff. So instead, they decided that the way to make it fun was to bring the historical figures to the present day, and have fun with that. One of the very first conversations Minkoff had at Dreamworks about this project was, how many historical times were Mr. Peabody and Sherman going to visit? Was it going to be like Back to the Future, where the characters only visit one historical period, or more like Bill and Ted, where they go all over? "I pitched one version of this movie where they would go to [Ancient] Egypt, and the whole movie would take place in Egypt," says Minkoff. "And that would be kind of the framing device — and that would be a bit more Back to the Future, in that they go to one historical place and solve one historical problem, and when that is resolved, they can sort of finish the movie. But everyone said, 'I think the fun of this is the historical characters, and the [different] times, and the time travel.' And we wanted [more of] that." And so even before they knew what the story was going to be about, they decided it needed to visit a lot more time periods, and be more Bill and Ted, in general. The original Mr. Peabody and Sherman cartoons are pretty basic, and don't include a lot of character development. So for a feature-length adaptation, how do you go about expanding their characters and adding more heart? It was a matter of "exploring what had been unexplored" in the cartoon, says Minkoff. "We would think, 'Well, he's a dog. He's an adoptive father. He has a son. What's that like? What's difficult about that? What are the challenges of that?' We sort of thought, 'Mr. Peabody is so exceptional about so many things. He's a master of almost everything. He's gotta have his Achilles heel.' So you know, raising a son can be really the issue for him that's he's not quite as masterful about." And meanwhile, they tried to imagine what kind of pressures a kid would face in the modern world, having a dog as his father. "Is everybody going to be accepting? Is that going to be okay, or not? How are people going to feel about it?" says Minkoff. "It was just taking the premise that existed, and looking at it from different perspectives." For a while, they they had the idea of doing Peabody as a live-action movie, with a computer-animated talking dog surrounded by actors. But Minkoff felt like the "whimsy" of having a world where nobody ever questions that a dog can talk would work less well in live-action. "Had we done it as a live-action movie with an animated dog — like Roger Rabbit, or Garfield — it would have lost that whimsy," says Minkoff. "There's something about the fact that he's a dog and nobody thinks about that, that you can do in animation but you can't do in live action." In fact, Minkoff started working on Peabody "well before" the Underdog movie was made. "We decided to do animation before Underdog came out, and once it did come out, I realized we made the right decision." He laughs. Given that Despicable Me and its sequel were such huge hits, I wondered if Minkoff was under pressure to make Peabody's father-son story more like that of Groo and his little girls.But if anything, it was the opposite — Despicable Me forced huge changes to the storyline of Mr. Peabody and Sherman. "We had a script that the studio liked, and Despicable Me hadn't come out yet," says Minkoff. In this script version, there was a totally different storyline about a villain "whose agenda was stealing the seven wonders of the world." After seeing the Despicable Me trailer, they had to change the Peabody script completely. "So that it was as different as we could make it," says Minkoff. In fact, the final movie has no villain at all. They tried different versions with and without villains, including ones where the villain was super crucial to the story and the whole plot is driven by the villain — but "where we ended up is saying, 'It's more of a relationship story about a father and a son, and the girl that changes the son, and how that affects the family. And made the story about that. Because if we had a villain working through the historical episodes, it would have entirely changed the nature of them, which would have gotten us a lot further away from what Peabody and Sherman is about." They experimented with showing more of Peabody's jerk side. In the cartoons, Mr. Peabody is not warm and fuzzy — he's actually kind of a jerk to Sherman. They experimented with including this dynamic in the movie, and it just didn't work. "We had a variety of 'Sit, Stay' jokes, and somehow they didn't land as funny," says Minkoff. "Maybe it's just that the world has changed," and the nature of parenting have changed enough that those things "didn't land funny, they just felt mean." 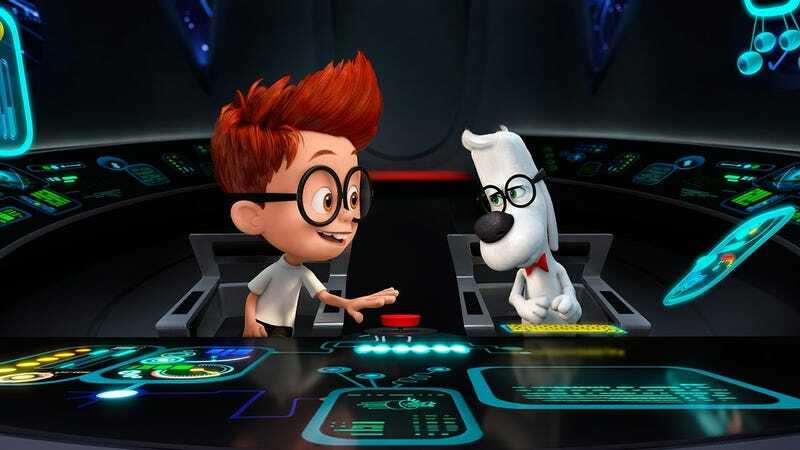 The only moment that survives in the final script is when Sherman tells Mr. Peabody "I love you," and Mr. Peabody replies that he has a warm regard for Sherman as well. Says Minkoff, "That worked because everybody could laugh and understand Mr. Peabody, and know that it wasn't that he didn't love him, it was that he hard time expressing it — which is a relatable thing." One moment from the film that you can see in some of the trailers is when Achilles, visiting the 21st century, says "Don't taze me, bro." It's a funny line — but there's no way Achilles would actually say that. "We, for the most part, tried to stay away from anachronisms like that," says Minkoff. "But that one was too good to pass up." And producer Alex Schwartz kept saying "You can't do that joke," partly because it's in poor taste — but then they watched the Youtube of the original incident and decided it was funny.